There must be a thousand or more ways to make biscuits and I would probably like them all! I love biscuits. A good Southern buttermilk biscuit with gravy just can’t be beat in my book. 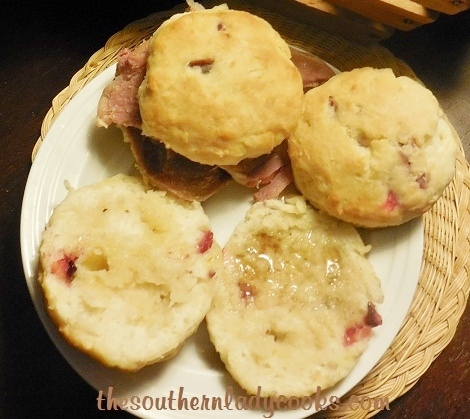 These ham biscuits are a great way to use up ham and so good for breakfast with coffee or just as a snack. Mix flour, baking powder, salt, garlic powder with a whisk. Cut the butter pieces into the flour mixture until looks like coarse crumbs. Add ham, cheese and milk. Mix with spoon and turn out onto floured board. I don’t roll this out. I just pat the dough out with my hands to desired thickness. I used a small cookie cutter, too, instead of a regular biscuit cutter. Baked on a sprayed cookie sheet in a preheated 425 degree oven until brown on top or 15 to 20 minutes. Makes about 2 1/2 dozen small biscuits. Serve with honey, preserves, molasses, etc. Enjoy! If you like this recipe, you might also like my recipe for Divine Garlic Cheese Biscuits. Was wondering about that….thanks for the input!! mmmmmm, these would be good with Bacon Gravy!! i’M GOING TO MAKE THESE, AS I HAVE HAM AND CHEESE. THEY SOUND GREAT. THANK YOU ALSO GOING TO TRY PEANUT BUTTER PUDDING CAKE. Do you have to use evaporated milk? Can you replace with buttermilk?? Yes, I think you could definitely use buttermilk. All of your biscuit recipes are wonderful. Wouldn’t these be great cut small and on a buffet table….mmmmm! These sound so good and may be just the thing for Father’s Day.